Concerns that large-scale development north of Horsham could miss the council’s affordable housing targets have been expressed this week. Last week the County Times revealed that Liberty Property Trust has submitted a planning application for 2,750 homes and a new business park north of the A264. 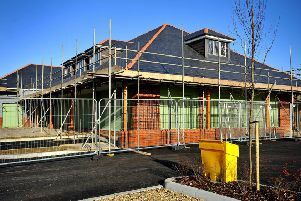 However campaigners have expressed concerns that the application only makes provision for up to 30 per cent affordable housing, below Horsham District Council’s target of 35 per cent set out in its local plan. Roger Smith, on behalf of the Campaign to Protect Rural England’s Sussex branch, said that district councillors who supported the North Horsham scheme had argued it would provide affordable homes for the town’s young people who might have had to move out of the area. Meanwhile Carol Hayton, of the Horsham Labour Party, added: “When they first told us of their plans for the North Horsham development, Liberty Property Trust assured Horsham residents that a key benefit would be the increased supply of the affordable housing that our district desperately needs. “How disappointing, therefore, to learn that their proposal undertakes to deliver a maximum of only 30 per cent affordable homes. The County Times exclusively revealed Liberty’s plans for 4,500 homes, new A&E hospital, business park, railway station, and supermarket on land north of the A264. Any hope of a new acute hospital disappeared after a crunch meeting between health officials and politicians. One senior councillor said it would be ‘very difficult politically’ to deliver the North Horsham scheme without a hospital as part of plans. HDC unveiled its preferred strategy for consultation, which included the North Horsham scheme, but this time for 2,500 homes and without a new hospital. Residents pack out Horsham’s North Heath Hall to hear about the plans for housing north of the A264. The meeting was organised by North Horsham Parish Council to give residents an opportunity to share their opinions on HDC’s preferred strategy. Several speakers objected to breaching the ‘sacrosanct’ boundary of the town. Councillors approved the proposed submission for consultation, after a motion supported by Lib Dems and some Conservatives to defer a decision was defeated. Hundreds of residents flocked to greenfields under threat of development to demonstrate opposition to the North Horsham scheme. Nine days of examination hearings into the draft local plan were held, with former HDC chief executive Martin Pearson returning to criticise the North Horsham scheme, which he said had been chosen as a ‘political decision’. The planning inspector’s initial findings upped the housing target, but appeared to accept the principle of housebuilding north of the A264. An attempt to shelve the North Horsham scheme by Tory councillors was defeated by 24 votes to 19, with critics of the move calling it ‘reckless and irresponsible’. Councillors approved the Horsham District Planning Framework, which included the North Horsham scheme, with one Conservative telling colleagues that it was ‘time to stop fighting the battles of the past’.